The business planning team working on the first phase of Saint Joseph's planned local food institute is comprised of Dr. Mark Green, left, sophomore Nick Guidi, senior Elyse Caiazzo, senior Hayley Winslow, group leader Peter Nielsen and Senior Director of Sustainable Enterprises Stuart Leckie. 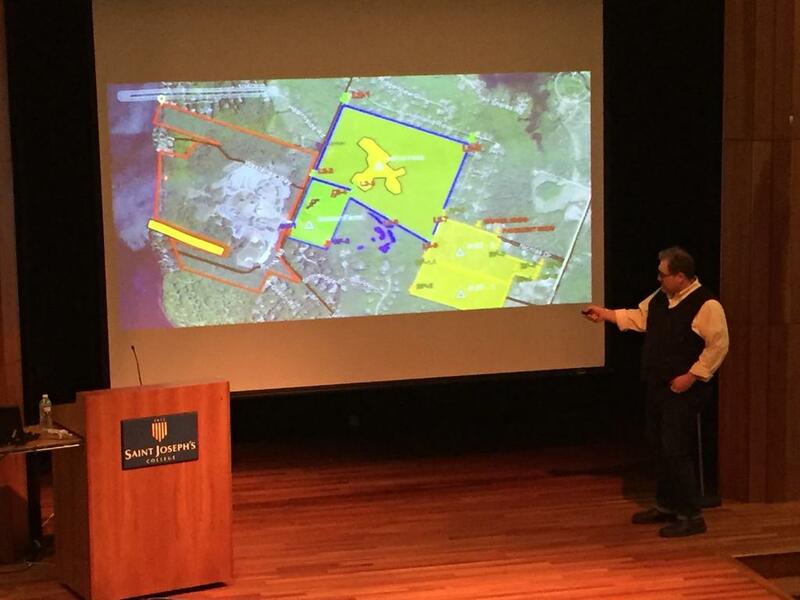 STANDISH — The business planning team behind the first phase of a new local food institute at Saint Joseph’s College gave its initial public presentation Monday night, outlining the potential impact the school hopes the project will have on its campus, the surrounding region and Maine. “It will help train a new generation of New England food entrepreneurs who are equipped with the skills to use new technologies to grow food year-round,” said Peter Nielsen, the school’s entrepreneur-in-residence and executive director of mission-aligned business at Saint Joseph’s, who is leading the six-person planning team. “And it will also create a lot of opportunities here for Saint Joseph’s students,” Nielsen continued. The college’s Institute for Local Food Systems Innovation, announced in September along with a nearly $2 million federal investment, is planned to include a hydroponic greenhouse, food manufacturing incubator, conventional farm with livestock and crops, and agritourism event space at the school’s existing Stone Barn. 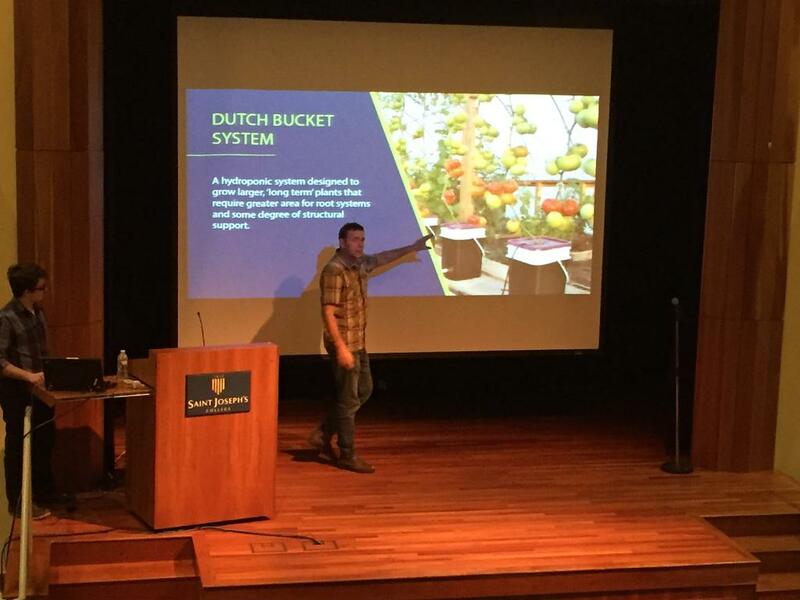 As outlined in the Feb. 12 presentation, the first phase of the project will be the hydroponic greenhouse operation, which will allow crops to be grown indoors without soil. Green said the school has reached out to the industry, including hydroponic tomato grower Backyard Farms in Madison, to get a sense of the expertise they’re looking for in today’s workforce. The hope is that the planned series of courses in hydroponic agriculture can help fill those needs. Green said the plan is to start growing lettuce and tomatoes in the nearly 17,000 square foot greenhouse facility, which will include five bays and utilize three different hydroponic growing techniques. Along with Nielsen and Green, the team includes senior director of sustainable enterprises Stuart Leckie and three current students: seniors Elyse Caiazzo and Hayley Winslow and sophomore Nick Guidi. Nielsen said the students are “rapidly becoming peers” and noted “how much fun it’s been” to work with them. Winslow, who said she grew up in Falmouth and is the sixth generation on her family’s farm, was hired part-time as the Business Services Manager for the college’s Mission Aligned Businesses. She has been working on the projected financial numbers for the institute, which Nielsen said will be part of a business plan released in late March. Toward the end of the presentation, Nielsen clarified that the college wants to add to the local food system without competing with local producers. Nielsen added that Saint Joesph’s President Dr. Jim Dlugos had committed to establishing policy for the institute specifically outlining the intent not to compete with local growers. He also gave an overview of the second planned phase of the institute, a 3,400 square foot industrial kitchen incubator that aims to help local businesses scale up their operations by becoming paid members at the shared commercial kitchen space. “This is bringing people out of their homes, out of their garages, out of their kitchens — wherever they may be, and bringing them into the facility where they can scale up production…” Caiazzo, who serves as the institute’s Assistant Program Director, said about supporting local entrepreneurs. Nielsen said the planning team had conducted “zero outreach” thus far to gauge interest from local businesses in being part of the industrial kitchen, but noted that the meeting Monday night was “day one” of working to make those community connections. 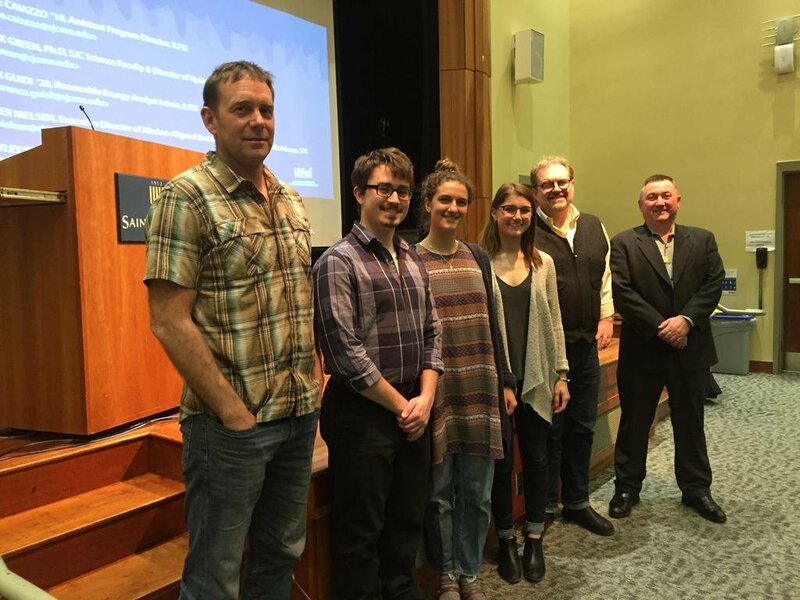 The business planning team working on the first phase of Saint Joseph’s planned local food institute is comprised of Dr. Mark Green, left, sophomore Nick Guidi, senior Elyse Caiazzo, senior Hayley Winslow, group leader Peter Nielsen and Senior Director of Sustainable Enterprises Stuart Leckie. Peter Nielsen of Saint Joseph’s College outlines the plan for the school’s local food institute. Dr. Mark Green explains the various forms of hydroponic farming techniques will be used in the school’s planned greenhouse facililty.